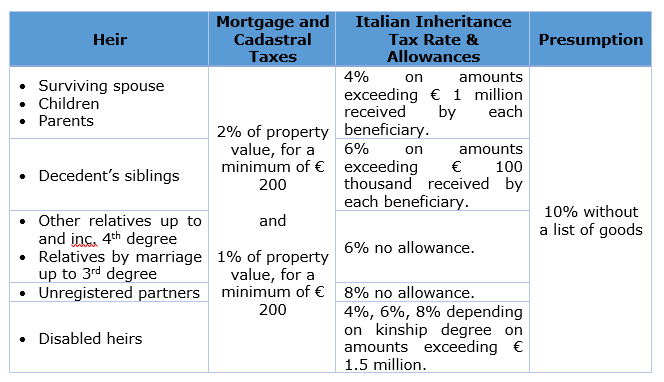 How does inheritance tax work in Italy? Inheritance tax is levied on persons who inherit estate and/or assets from a deceased person. It is payable to the Italian State. It is based on the inheritance tax declaration filed by heirs to the Inland Revenue Office. Inheritance tax rates adopted by the Italian law are fairly limited, thanks to allowances. What is the inheritance tax rate in Italy? Italian inheritance tax – which is a patrimonial tax – is calculated at three different rates (4%, 6% and 8%). The rate payable depends on the degree of kinship between the decedent and the beneficiary. See the table below. A spouse, parents and/or children, pay 4% on amounts exceeding € 1,000,000 for each individual beneficiary, below this amount, there is no inheritance tax liability. Siblings pay 6% tax, but are entitled to an allowance of € 100,000. Also in this case the allowance is calculated on each individual heir or beneficiary per subject. Other relatives up to the fourth degree, relatives by marriage in a direct kinship, and collateral relatives by marriage up to the third degree pay 6%, without any allowance. These beneficiaries pay inheritance tax on all the amount received. This category includes nieces, nephews, grandnieces, grandnephews (descendants of your brothers), aunts, uncles, great-aunts, great-uncles, first cousins, children-in-law, parents-in-law and siblings-in-law. All other beneficiaries and heirs such as the most distant relatives, pay the inheritance tax rate of 8%, irrespective of the amount they inherit. In addition to the above, also in case no inheritance taxes are due, Italian government fees to transfer Italian real estate holdings apply. Your inheritance will therefore be subject to mortgage and cadastral taxes in addition to inheritance tax, where applicable. They are based on the value of the real estate property included in your inheritance. These are based on the same taxes you would pay for example, in case of sale of your property. Mortgage Tax:2% of real estate property value as set by cadastral records, not the appraised value, for a minimum of € 200. Cadastral Tax:1% of real estate property value as set by cadastral records, not the appraised value, for a minimum of € 200. TIP! The Italian Revenue Office Agenzia delle Entrate applies the presumption of 10%. The presumption of 10% means that the Agenzia assumes that the value of your inheritance is higher of at least 10%, since it normally includes goods such as jewels, movable goods not expressly declared in succession. The presumption of 10% can be avoided by attaching to the declaration of succession a detailed list that includes all inherited goods. In the absence of such list, the presumption of 10% will be applied. Continue reading how to pay Inheritance tax and the news in 2019. 1% of € 550,000 = € 5,500 as cadastral tax. You will pay a total sum of € 38,500 for the Italian succession taxes. You are the donor’s spouse, your inheritance is worth € 300,000, so it does not exceed the tax-free allowance of € 1,000,000. 1% of € 330,000 = € 3,300 as cadastral tax. You will pay a total sum of € 9,900 for the Italian succession taxes. If you want to deepen your case with us do not hesitate to contact us our advising partners for a free preliminary consultation.